Hotshot attorney Ellen Meade seems to have it all: a powerful position with her firm, a posh downtown apartment, and a bright future ahead of her. But for Ellen, the future grows dimmer with each passing day. Her apartment is lonely without her best friend, and the demands of her job are slowly killing her soul. She’s simply surviving until she bumps into a police officer who changes everything. Burke Tipton loves his job as a Mounted Patrol Officer in downtown Portland. The life he’s built away from his family’s ranch is simple and uncomplicated. At least it was until a beautiful woman bumps into him and turns his world upside down. 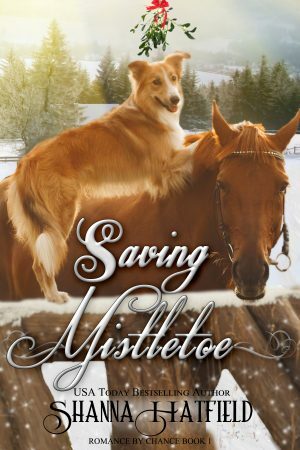 Add in Burke’s partner Sugar Bear, Lovey the dog, and a child named Mistletoe in need of a Christmas miracle, and you get a heartwarming, holiday romance from USA Today Bestselling Author Shanna Hatfield. Slowly opening her eyes, she glanced up at the scowling, tanned face of a police officer as he sat astride his large chestnut mount. The horse shook his mane and glanced back at her, as though he measured her worth and found her severely lacking. She pushed against the man’s muscled thigh to regain her balance and took a step back. The contact with his leg left her further unsettled than she’d been mere seconds before. Who had muscles like that, anyway? His thigh felt like it was made of steel. What was the guy, a fitness nut? The short sleeves of his uniform shirt only accented his biceps and broad shoulders. A brief perusal that started at the top of his hat and ended at the toes of his shiny leather riding boots confirmed that the man was, indeed, in prime physical shape. His gaze held a hint of scorn as he continued to stare at her with a disapproving frown. “May I help you, miss?” he asked in a smooth voice that held the hint of a drawl. He didn’t sound Southern, exactly, but he wasn’t from Portland, that was for sure. The man had a rugged, outdoorsy look to him. His seat on the back of the tall horse only accentuated the persona. “No, thank you,” she said. Another step back nearly carried her into two businessmen walking past her. One of them gave her a cool glare while the other shot her an interested glance. “Are you sure, miss? You seem to be a little lost.” The officer’s expression didn’t soften as he held her gaze with eyes that were a surprisingly clear shade of blue. In spite of his gruffness, Ellen couldn’t help but notice the sculpted firmness of his lips, particularly the top one.